Recently, MoCo’s political community has been thinking of changing the structure of the County Council. Since 1990, the council has had four at-large members and five members elected by residents of districts. One idea is to reduce or eliminate the at-large members and replace them with more district members. Advocates of that perspective believe the districts are too large, that district members are more responsive than at-large members and that the cost of running at-large enables interest groups to play more in those elections. We offer no opinion on any of those theories, but prior election history points to one consequence of shifting to an all-district council. The level of political competition will almost certainly decline. Why do we believe that will happen? Consider recent elections. 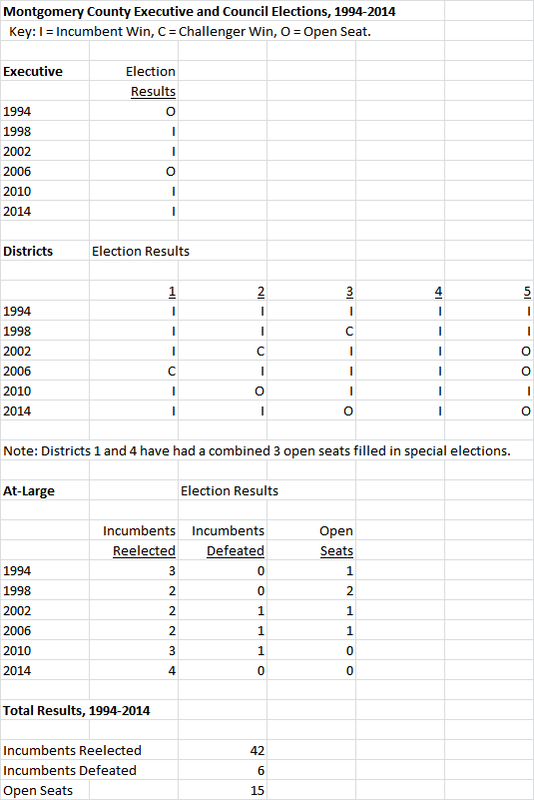 Below is a chart showing the results of all district council elections since 1998. Over that period, there have been 28 district council elections, 20 of which featured incumbents. The incumbents won 17 of 20 races, an 85% win rate. If the Republican incumbents are omitted, the remaining Democratic incumbents won 14 of 15 elections, a 93% win rate. If that is not enough to prove the non-competitiveness of these elections, consider just two facts. 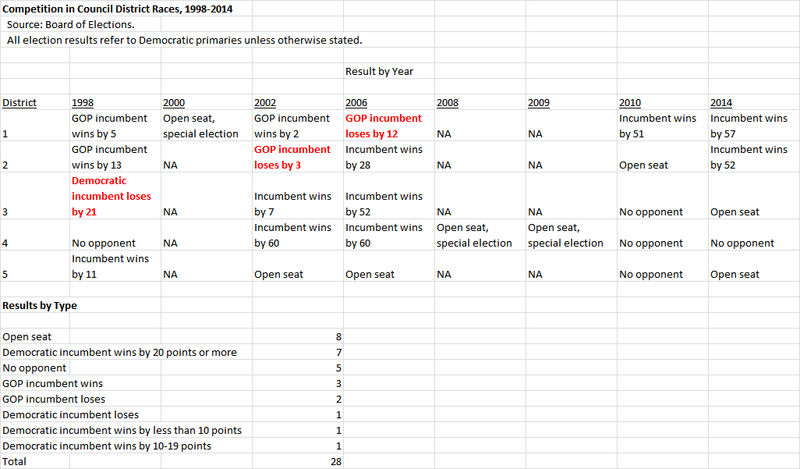 First, only one Democratic district incumbent has lost under our current structure, and that happened in 1998. Second, of the last six contested district races, five saw the incumbent win by more than fifty points. Meanwhile, the at-large races are much more competitive. 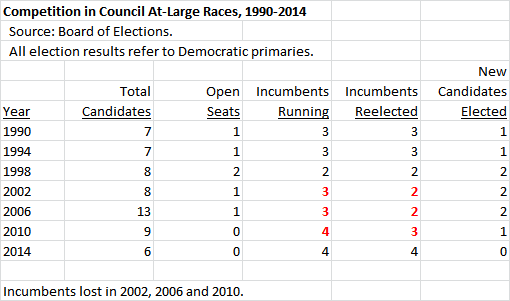 Since the current system was established in 1990, no group of at-large incumbents has ever run unopposed. Three Democratic incumbents have lost – Blair Ewing (2002), Mike Subin (2006) and Duchy Trachtenberg (2010). Even in the two elections in which all four incumbents ran for reelection (2010 and 2014), challengers still entered the race and one of them (Hans Riemer in 2010) knocked out an incumbent to win. This year, those same trends continue unabated. There are 25 at-large candidates (with more to come) running with three seats open. Meanwhile, district incumbents Nancy Navarro (D-4) and Tom Hucker (D-5) have no opponents while Craig Rice (D-2) has token opposition in the primary. Only Sidney Katz (D-3) has a serious challenger. This disparity persists even in the presence of public financing, which was supposed to promote competition. What explains this pattern? After all, district races are theoretically cheaper than at-large races because they have fewer voters. The reason is that one-seat races against incumbents are very different affairs than at-large contests. A challenger running against an incumbent for one seat must show that the incumbent has committed a firing offense; otherwise, voters will support the candidate they know better. These one-seat races can turn nasty as we have seen from recent MoCo Senate elections as well as the bitter fight between Council District 5 incumbent Derick Berlage and challenger Marc Elrich twenty years ago. At-large races are seldom negative unless slates are formed to compete against each other. (That hasn’t happened since 2002.) At-large challenger Hans Riemer ran a model race in his 2010 win, promoting his policy agenda of progressivism and smart growth and never targeting any single incumbent for criticism. Most candidates don’t have the stomach for negative elections when an open seat is available. And in six of the last eight at-large races (including next year), at least one seat has been open. Political competition is extremely valuable. It should not be discarded lightly. There may be good reasons to increase the number of districts, but if at-large members are completely eliminated, voters will pay the price with fewer choices and less accountability at election time. Right about now, the happiest man in Montgomery County lives in Boyds. He is 74, a huge sports fanatic, a long time attorney, a former state Delegate, a perpetual candidate and a tireless activist. He loves the County Council because some of its members give him endless material for use in his never-ending demagogic campaign to weaken and ultimately paralyze county government. Yes folks, we are talking about the notorious political heckler Robin Ficker. And he must be jumping for joy at the news that some members of the council are considering a possible new soda tax. Ficker has been running for office and placing charter amendments on the ballot, mostly intended to limit taxes, since the 1970s. The huge majority of his amendments have failed, often because the political establishment labeled them “Ficker amendments” to exploit the national infamy of his heckling at Washington Bullets games. One exception was the razor-tight passage of his 2008 charter amendment mandating that all nine Council Members vote in support of exceeding the charter limit on property taxes. But Ficker has never had more ammo than in the last four years and he has used it to push his anti-government agenda. Consider what has happened. The council’s approval of a large salary increase for its members in 2013 and its passage of a 9% property tax hike in 2016 gave Ficker’s term limits charter amendment momentum. Some Council Members then used their campaign funds to finance a lawsuit to keep term limits off the ballot, which failed. Council Member Nancy Floreen’s “exasperated” and “defensive” performance in a television debate with Ficker and Council Member George Leventhal’s comparison of term limits supporters with Brexit voters didn’t help. Ficker predicted term limits would pass by twenty points; instead, they passed by forty. Robin Ficker thanks MoCo voters for giving him his biggest political win ever. That’s not all. Ficker has enrolled in the public financing system established by the council for his latest Executive run. And he requested the county government’s email lists after another resident obtained them under the Public Information Act. Any competent campaigner – maybe even Ficker – should be able to use those thousands of emails to raise enough money to qualify for public matching funds. And now we have news of the soda tax, which prompted gleeful self-promotion by Ficker in Bethesda Magazine’s comment section. Expect a Facebook ad soon. Your author does not enjoy writing this column because we find merit in this particular tax. Sugary drinks and soda are public health menaces, especially to children. The intended use of the money for early childhood programs is a good idea. And the current tight budget does not give any quick or easy options for funding undeniable, but expensive, priorities like early childhood education. But the counter-argument from Ficker, who calls Council Members “tax increase specialists,” is obvious. “They’re not listening to you,” Ficker will tell the voters. “You told them no more tax hikes and they’re going to do it anyway.” Even Leventhal, who has voted for numerous tax hikes and has done as much to promote public health as any Council Member ever, has come out against the new tax. The danger here is not that Ficker will be elected. Voters made that mistake once all the way back in 1978 and have never come close to repeating it since. The real problem is the next charter amendment that Ficker will inevitably introduce after his latest election campaign fails. Whatever else Ficker is, he is an astute student of Maryland county tax policies. He is fully aware of the taxation and spending limits in the Prince George’s County charter, such as the requirements that the property tax rate may not exceed 96 cents per $100 of assessed value and that bond issues, new taxes, other tax increases and some fee increases be approved by voters. He is also aware of provisions in the state constitution and several county charters that forbid legislative bodies from adding spending to executive budgets. Indeed, some of his past charter amendments have been variants of such policies. It’s one thing to raise taxes during terrible economic downturns as the county did in 2010. That simply had to be done. It’s a very different thing to discuss new discretionary tax hikes in times when voters are not convinced that they are absolutely needed. If the council would like to have more money available for worthy programs, it should focus on growing the economy, stop adding ongoing miscellaneous spending financed by one-shot revenue sources, redirect cable fund money to purposes that actually benefit the public and restrain some parts of the budget to finance expansions of others. Doing those things will free up tens of millions of dollars, and maybe more, over time. But constant talk, and occasional passage, of discretionary tax hikes will only help Ficker place a Prince George’s-style anti-tax doomsday charter amendment on the ballot. Should such a thing pass, no soda tax will save us. Hence a warning. If you give Robin Ficker enough ammo, even he will eventually hit the target. The untold story of last year’s 9% property tax hike is that it was not merely the product of needed funding for public schools or the adverse consequences of a U.S. Supreme Court decision on income taxes. It was also the product of an innate bias towards more spending built into the County Council’s budget process. That bias created mounting pressure to fund ever-growing spending programs accumulated over many years which contributed to the tax increase. The next generation of county elected officials must reform this process or they too will eventually feel compelled to raise taxes. All state and local operating budgets must be balanced each year as a matter of law. At the state level, the General Assembly may cut spending items in the Governor’s budget but they generally cannot add to them. (The legislature can and does pass laws mandating spending on certain items in future years.) Several counties with Executives follow the state’s model, as does the City of Baltimore. But the Montgomery County charter grants all final budgetary authority to the County Council, which can do almost anything it wants to the Executive’s recommended budget. It can add, subtract or rearrange spending items subject only to requirements in state law, such as mandatory minimum funding levels for public schools and the college. Other than that, the only constraint on the council’s power is that the budget it passes must be balanced for the fiscal year. Every March 15, the Executive is required by the charter to send a recommended budget to the council. The council then begins its process for reviewing and changing the budget that lasts roughly two months. The council’s vehicle for altering the Executive’s recommended budget is the reconciliation list (commonly called the rec list), which is a ledger of spending additions and deductions. Each council committee, and the full council itself, can post additions or deductions to the rec list. The last step in the process is figuring out how to finance some portion of the additions since they always exceed the deductions. In theory, there are two sound places to go to fund additions to the Executive’s budget: new tax revenues or offsetting spending cuts. In practice, the council’s use of these resources is limited. Tax increases are typically proposed by the Executive, who distributes the revenues they generate across spending items in the recommended budget. In such cases, the new revenue is not available for further spending desired by the council unless it alters the Executive’s choices. The council could also cut the Executive’s spending items and use the money for its own items. But the Executive’s spending proposals have constituencies who will squeal if they are diverted or cut. No one likes to be the bad guy at budget time! Page one of the council’s final draft reconciliation list for FY18. These are some of the new spending items the council wanted to fund last spring. The challenge was how to pay for them. If new taxes and spending cuts are insufficient to pay for new spending desired by the council, other funding sources must be identified. In the past, favorite sources for funding included setting aside less reserve money than proposed by the Executive, setting aside less money for retiree health benefits, occasional transfers of cash from the capital budget and other one-time fixes. In FY12, the Executive proposed $10 million for snow removal and the council redirected $4.1 million of that for new spending on the reconciliation list. Snow removal costs must be paid, so if they were to ultimately prove larger than budgeted funds, the council’s action would be tantamount to a backdoor drawdown of the reserve. Since FY05, the council has added a combined $245 million to the Executive’s budgets through its reconciliation lists. One does not have to be a certified public accountant to see what the effect of these additions will be over time. 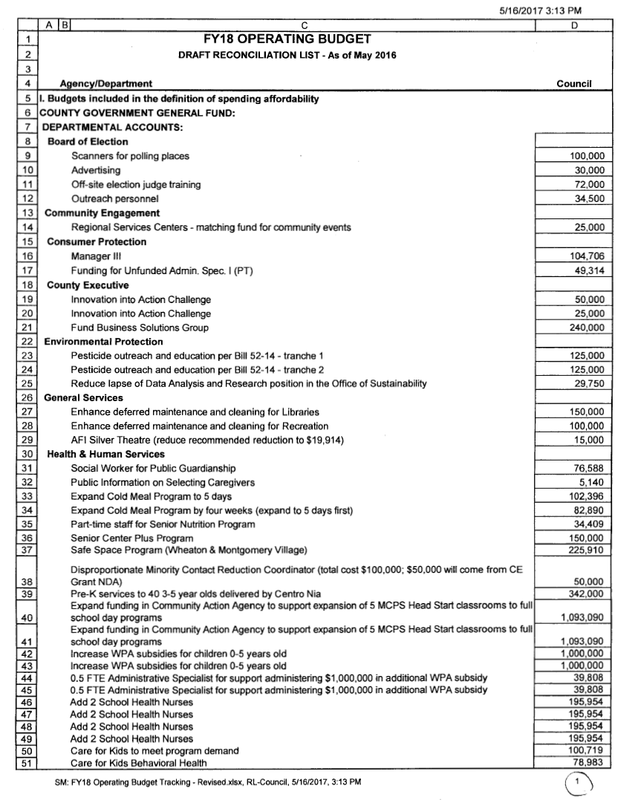 Many spending items added by the council are ongoing, such as hires of new employees and expansions of programs expected to continue indefinitely. But some of the funding sources for the new spending are one-time in nature, like capital budget transfers and reserve drawdowns. Repeated use of one-time funding sources for ongoing spending creates enormous long-term pressure on the budget. Eventually, especially when a downturn comes, the new spending must be trimmed or taxes must be raised. Guess which is more likely to occur? Why does this happen? It’s not because elected officials are stupid. It’s because of the incentives they face. From mid-March through mid-May every year, Council Members are besieged by requests for more spending from the community. Every year, there are three nights of hearings jam-packed with constituents wanting more money for their favored programs. They are followed by dozens of meetings with groups who want even more than that. Aside from occasional admonishments from council administrator Steve Farber and Executive Branch budget officials, there are almost no voices for moderation in the budget process. And here’s the thing: whether it’s hiring social workers, funding more childcare assistance, deploying more police officers in communities that need them, removing more tree stumps or much, much more, almost all the new spending proposals have merit. Given the incredible pressure brought to bear by groups with genuine funding needs, it’s kind of a miracle that the budget gets balanced at all. All of this creates serious problems for the County Executive. The charter grants the Executive a line item veto over spending items, but this is never used because the council would simply override it. The Executive could abstain from including the council’s new spending in next year’s budget, but again, the council could just put it back in. For the most part, the Executive and his top aides grumble in private and put on a happy face for Wall Street, but they did go public in objecting to a $10 million draw from the reserve two years ago. Instead of fighting the council, the Executive’s staff simply tries to figure out how to retain and pay for the council’s new spending in next year’s budget. And each year, the job gets a little harder without new revenue. This process is a big reason why the county has had seven major tax hikes in the last sixteen fiscal years. Next year, a new County Executive and at least four new Council Members will take office. This new generation of officials will have a choice. They can keep the existing budget process and eventually come under pressure for yet another tax hike, as happened last year. Or they can reform it by requiring that new ongoing spending be offset by actual ongoing spending cuts, not one-time measures. Failure to learn this lesson will mean repeating history. We will conclude with one last lesson from the Giant Tax Hike in Part Three. Ever wonder why some politicians stay in office waaaaaay too long? One reason is that some of them believe they are truly essential and that government would collapse without them. We will give them this: some politicians really do leave a lasting mark, and even sometimes for the better! But the true operations of government depend on legions of competent, honest and experienced public servants who are almost totally unknown to the public. These are the essential men and women who keep the trains of government running on time. And in Montgomery County, the most essential man of all is unquestionably Steve Farber. Farber has one of the most mundane titles of all time: council administrator. At first glance, such a title connotes unglamorous tasks like emptying garbage pails, cleaning windows, wiping the dais and changing toilet paper rolls. But in fact, the position is crucial to the proper functioning of the County Council and Farber excels at it. Unfortunately for all of us, he is retiring. Part of Farber’s job is to be the leader of the council’s Fifth Floor staff. These employees are not part of the personal staff retained by Council Members in their offices but are rather central, merit system analysts who advise the institution as a whole. They are subject matter experts, each overseeing the operations of a few departments and/or agencies on behalf of the council. When legislation is introduced, briefings are held or budget items are considered, the Fifth Floor analyst who covers the relevant subject areas gathers pertinent information and writes it up for the council to consider. Occasionally, the analyst will make recommendations with the understanding that Council Members have the final word. At its best, the Fifth Floor acts as a check and balance on the views of the departments and agencies overseen by the council. It is hugely important for Council Members to have their own independent sources of expertise; otherwise, they might tend to see primarily what the Executive Branch and the agencies want them to see. The Fifth Floor predated Farber’s arrival, but he expanded their ranks, protects their independence and champions their contributions. But Farber is so much more than the merit staff’s leader. He is the ultimate consigliere, the quiet adviser in the shadows who knows all and says little – at least in public. His immense and largely secret power derives from three sources. Farber has been at the council since 1991 and has an incredible memory. No matter what the council deals with in the present, he has seen something like it in the past and recalls it like yesterday. Names, dates, policies, documents – whatever it is, Farber either knows it or knows how to get it. Few people in county government compare to him on this measure and no Council Member comes anywhere close. That gap in knowledge can put Farber in the driver’s seat when no one can really see that he’s driving. Another secret of Farber’s success is that he spends his political capital very carefully. He is concerned with budgetary and fiscal issues, especially ones affecting long-term sustainability and the bond rating, but it is otherwise rare for him to weigh in directly on legislation or policy issues. By picking his spots carefully and not squandering his power, Farber maximizes his ability to influence the big picture events that he cares about most. Every year, the council proposes to add millions of dollars to the Executive’s recommended budget. Their vehicle is the reconciliation list, which is a ledger of spending additions and reductions that must be balanced out at the end. One of Farber’s tasks is to find a way to pay for this list. No one else in the building fully understands how he does this. His unique, encyclopedic knowledge of the county budget enables him to locate money under the couch cushions that few others know about. Try as they might, it is impossible for the Executive Branch to hide money from Farber. He never funds the entire reconciliation list – and constantly warns the Council Members (often futilely) not to overstock it – but he finances enough of it that the council is usually satisfied. It’s an incredible and invisible source of power. How does he pull all of this off? It’s a great mystery, but sometimes there are clues. First, he never gets involved in politics, NEVER. He never takes sides in spats between Council Members or tries to steer politically sensitive things like who gets selected as Council President. Second, he never takes credit for anything. If you listen to Farber, he has never had a good idea. Instead, it’s Council Members from the past who have done great things – even if they really originated with Farber. When he talks to current Council Members, he will remind them of these past accomplishments and suggest similar monumental undertakings. If a Council Member agrees, then the idea becomes his or hers – and not Farber’s. The consigliere will then praise the enlightened ideas of the boss! Third, he never makes arguments based on personal or political concerns, only on facts – of which he is the undisputed master. And fourth, his discretion is second to none. The CIA could waterboard every person in the council building and Farber is the one who would never talk. Everyone knows this. That’s why they talk to him. And that’s why the consigliere knows more than the rest of them. For all his greatness, Farber has had ups and downs like everybody. For many years, he was a lonely voice calling for fiscal restraint, occasionally joined by Council Members Phil Andrews and Marilyn Praisner. That earned him the resentment of union leaders and agency heads who prefer loose purse strings. Farber got his way during the Great Recession, when the council had little choice but to cut spending and abrogate labor contracts, and he played a big role in saving the county’s bond rating. But the subsequent easing of fiscal pressure allowed the council to start spending again, resulting in the Giant Tax Hike and the passage of term limits. If the council had listened to Farber all along and passed regular modest, restrained budgets, there’s a chance those things may not have happened. County residents have benefited mightily from Farber’s service even though the huge majority of them have no idea who he is. His dedication to facts over rhetoric, his devotion to sound fiscal management, his work to have the council act as a real check on the Executive Branch and above all his iron integrity have made county government more honest and efficient than it would otherwise be. Farewell to MoCo’s Essential Man. 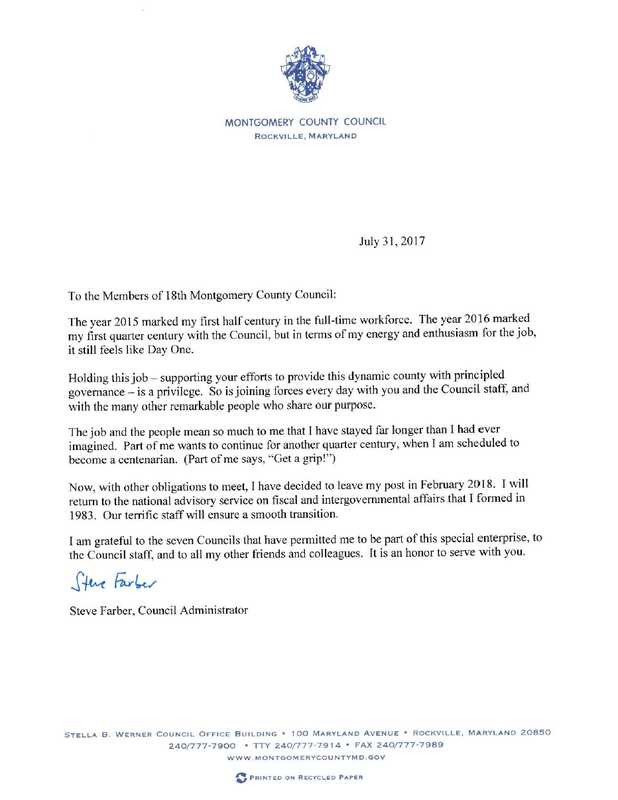 Montgomery County Council Administrator Steve Farber is retiring. This is a colossal event for the county and we will have much more to say about it soon. For now, here is the letter that he sent to the County Council. On Tuesday, the County Council learned that their own spokesperson is planning on running for one of their seats. Um, OK. And… they learned about it like everyone else did by reading it on MCM. Neil Greenberger, who has been the council’s Legislative Information Officer since 2006, announced his potential candidacy by telling MCM, “I would chance to say I know as much about county government as anybody in the county.” Including his bosses? Um… well, you get the point. Greenberger could run in District 2 if incumbent Craig Rice vacates his seat. Otherwise, he would run at-large. Greenberger said he would stay in his job while he runs for office and give it up only if elected. To appreciate how strange this is, let’s understand that the two most sensitive staff positions for most elected officials are their Chief of Staff and spokesperson. The former person is privy to the official’s most confidential discussions and decision-making. The latter is the official’s conduit to the public. Both individuals have to mirror the boss’s priorities exactly and can never diverge positions from them outside of closed doors. That’s part of the deal when you work for an elected official. Patrick Lacefield, Greenberger’s counterpart in the Executive Branch, works for one boss. And Ike Leggett, by all accounts, is a good boss to have. Greenberger has NINE bosses and not all of them are as gentlemanly as Leggett. Imagine having nine ropes around your neck pulling in nine different directions and you have some idea of what it’s like to be Greenberger. It is not an easy job. Now imagine what happens if Greenberger actually runs. During the day, he would continue to be the council spokesperson, working with the members and their staff to get out information to the public. And then at night and on weekends, he would be a fellow candidate. Let’s remember that open seat candidates are frequently asked what they would do differently than the incumbents. So part of the time, Greenberger would be working for the Council Members and the rest of the time he would be critiquing them. It gets even weirder. If Greenberger runs at-large, he will be running against current at-large incumbent Hans Riemer, who is sure to seek a third term. It’s also possible that he could run against District 5 Council Member Tom Hucker, who could run at-large. Then there’s the matter of all the other at-large candidates (and there will be a lot of them). Suppose Greenberger loses. Will his victorious opponents then be required to retain him as their spokesperson? We can’t recall another occasion when the council’s own spokesperson ran for one of their seats. The closest recent analog to this situation happened in 2006, when George Leventhal’s Chief of Staff, Valerie Ervin, decided to run for the District 5 seat. Since Leventhal was an at-large member, Ervin was not running against him. But she still left her Chief of Staff position as the campaign started. Greenberger has as much right to run for office as any other county resident. But if he stays in his current job while he runs against one or more of his employers, he will be creating immense conflicts. Council Members need to trust that their communications are written for their benefit and for the benefit of the institution – not for the personal political benefit of the individual writing them. The fact that they were blindsided by the MCM article is not a good sign for future trust. Unless adult supervision steps in – and we are talking about the council’s staff director, Steve Farber – this could be a wild ride. The No on B Committee, the ballot question committee opposing Montgomery County term limits, has filed its first campaign finance report with the State Board of Elections. 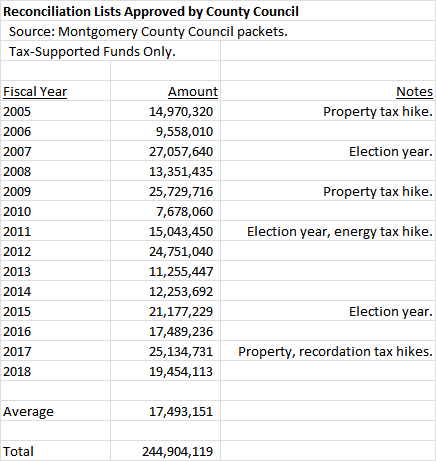 There are no surprises here: most of the contributions it has raised have come from incumbent members of the Montgomery County Council. The committee reported raising $9,125 through October 9. Of that amount, $6,000 (66%) has come from the campaign accounts of Council Members. George Leventhal was the lead contributor, donating $1,500. Roger Berliner, Sidney Katz, Nancy Navarro and Hans Riemer contributed $1,000 each while Marc Elrich contributed $500. Other contributions of note came from George Leventhal’s father, Carl ($500), Marc Elrich’s Chief of Staff, Dale Tibbitts ($500) and Casa de Maryland ($1,000). In total, contributions from Council Members and their staff accounted for 72% of money raised by the committee. After paying attorney Jonathan Shurberg $5,000 for his work on the unsuccessful court case to get term limits thrown off the ballot, and paying other minor expenses, the committee reported a final balance of $4,024.49. Another committee formed to support term limits, Voters for Montgomery County Term Limits, reported raising $2,890 and finishing with $2,683.27 in the bank. Developer Charles K. Nulsen III contributed $1,000. There have been rumors of developer support for term limits, which would be interesting considering that the anti-development Montgomery County Civic Federation also supports term limits. But Nulsen’s lone contribution signals that so far the real estate community is not fully engaged. In 2012, 460,885 MoCo residents voted in the general election. A similar number could be voting this year. What’s clear is that neither committee has the resources to get its message out to the electorate. Since many underlying factors favor the passage of term limits, the failure of both sides to raise money is a net benefit for supporters. The fight over whether term limits should apply to Montgomery County elected officials is now underway, and that’s even before political heckler Robin Ficker has submitted his signatures for his proposed charter amendment. Supporters and opponents are offering arguments for their point of view, some with merit and some without. Today we will take down one of the most prominent arguments from each side. The historical record shows plenty of competition for elected office in Montgomery County. It just doesn’t happen to be the kind of competition that some term limits supporters want. Since charter government was established in 1970, there has been one Republican County Executive (Jim Gleason, the first to hold that office) and three Republican Council Members (District 1’s Betty Ann Krahnke and Howard Denis and District 2’s Nancy Dacek). The other county elected officials have all been Democrats. But there has been substantial competition among the Democrats over the years, including the Neal Potter vs. Sidney Kramer factions in the 1980s and early 1990s and the competing council slates in 2002. Below are the election results over the last six cycles. Incumbents were reelected 42 times and lost 6 times. It’s important to note that two of those six losses were by Republicans in general elections: Dacek (2002) and Denis (2006). Including them, incumbents had a win rate of 88%. But when you count the open seats (15 of them including three special elections), newcomers filled seats one-third of the time. That’s plenty of turnover and FAR more than Congress. Ficker’s objection is that Democrats replace other Democrats, and term limits won’t change that. This is an argument made by four-term council incumbent George Leventhal, who has called term limits “a dumb, unnecessary protest gesture” and compared supporters to Brexit voters. Leventhal has also noted that Help Save Maryland, which the Southern Poverty Law Center has labeled a “nativist extremist” group, has gathered signatures for the charter amendment. This is a clear attempt to marginalize term limits supporters and paint them as pawns of racist xenophobes. There are two problems with this argument. First, if Ficker, Help Save Maryland and the county GOP were the only people in favor of term limits, they would have absolutely no chance of passage. So why are Council Members like Leventhal so worried about it? The answer is that he and other opponents know the issue is getting broader traction. Second, the motivations of supporters are almost entirely local ones. Consider the following groups who might be tempted to back term limits. The nine percent property tax hike is extremely unpopular, unnecessarily large, and could not have come at a worse time. If term limits becomes a proxy vote on whether the Giant Tax Hike should have gone through – and Ficker is doing everything in his power to link the issues – term limits will pass by a mile. Business owners and managers have been complaining incessantly about the difficulty of doing business in Montgomery County for many years. Passage of repeated tax hikes along with progressive legislation that increases the cost of doing business feeds into their unhappiness. Then there are the restaurants and retailers who are forced to do business with the county’s incompetent Department of Liquor Control. Term limits seem like a good idea to some of them! First, the County Council abrogated the county employee unions’ collective bargaining agreements . Next, the council introduced legislation to weaken their ability to negotiate. Some in labor are furious and there is even a chance that one or more unions could SUPPORT term limits. One thing that many people outside labor don’t understand is that unions are political organizations. Local union leaders are elected by their members every three years. Each union has to deal with internal discussions, occasional disagreements and even dissent. Members have expectations of service and performance, and when they are not met, there can be consequences. When an employer rubs a union leader’s face in the bitter mud of defeat, that leader must fight back or risk being seen as weak. And if such a leader tells members that term limits are the only way to defend their rights in the workplace, a lot of those members are going to listen. Republicans and unaffiliated voters have long been on the outside looking in at county politics. But many moderate Democrats, especially those far away from the liberal precincts near the Beltway, don’t feel adequately represented either. True or not, comments about “Takoma Park liberals” dominating county government are not unheard of, even among Democrats. The county Democratic Party’s rank-and-file is more ideologically diverse than its elected leadership, and if the leaders don’t do things to keep moderates on board (like limit the size of tax hikes), they will lose some of them to the likes of Governor Larry Hogan and even to the cause of term limits. Note the common thread of the concerns held by the above groups: none of them are linked to racism, xenophobia or political extremism. Whether they are right or wrong, all are rooted in local issues and many are in line with these folks’ self-interest. In general, it’s a REALLY bad idea to call voters “dumb” even if sometimes there’s a little bit of truth in it. If that’s the argument that term limits opponents use, term limits will DEFINITELY pass. 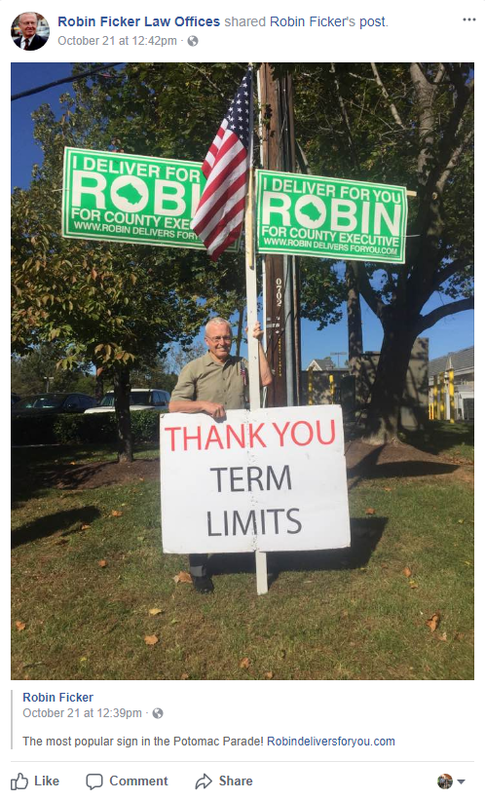 Montgomery County political heckler Robin Ficker, who has tormented politicians and voters alike for decades, is on the verge of getting a charter amendment calling for term limits for county officials on the ballot. Ficker’s previous term limits amendments failed by 8 points in 2000 and 4 points in 2004. But Ficker, whose energy and combativeness have not declined with age, is trying again. And this time the heckler just might get the last laugh. Many things have changed over the last twelve years, and all of them favor the passage of term limits. Consider the following. I have written in great detail about the county’s Giant Tax Hike, but look at it in simple terms. Imagine a public gathering of county residents at a restaurant, a festival, a park or any other public space. Then give them three options from which to pick. First, they could have a nine percent hike in property taxes that would be spread throughout the county government. (That is what the County Council passed.) Second, they could have a tax hike of about half that size with the proceeds going towards education alone. (We laid out how to do that in a prior post.) Or third, they could have no tax hike. Which option do you think they would pick? Which one do you think would they be LEAST likely to pick? Many voters will go to the polls with twin sets of two words on their minds – “tax hike” and “term limits” – and for a lot of them, they go together. That’s what Ficker is counting on and by maximizing the tax hike, the County Council played right into his hands. We spent a lot of time discussing the near disappearance of local media coverage in our Politics After the Gazette series. The result of this is that people know a lot less about what their elected officials do than they did twelve years ago. Back then, the Post had multiple reporters covering county government and it competed vigorously with the Gazette and a daily, the Montgomery Journal, both of which are gone. Now, there are basically two people responsible for local news here: the Post’s Bill Turque and Bethesda Magazine publisher Steve Hull. That’s it, folks. When voters don’t know what their government does, they are less likely to understand it and trust it. And the few stories that remain are disproportionately negative ones. Over the course of the last year, the two dominant stories on Montgomery County government have been the Giant Tax Hike and the dreadful performance of the county’s liquor monopoly. Neither one generates happiness among the public. Voter turnout has been declining in Montgomery County for some time now, although this year’s contested Presidential primary was an exception. Consider the trend in mid-term primaries, which usually decide elections for county officials. In 2002, 143,762 voters turned out in MoCo’s primary. That number fell in every cycle through 2014, when 111,231 voters turned out. That is actually less than primary turnout in 1990, when 118,527 people came out to vote. The declining number of voters shrinks the mailing universe used by county-level candidates, meaning that an ever-smaller number of people receive communications from candidates. The number of Democrats who voted in all three of the 2006, 2010 and 2014 primaries totaled just over 40,000 people, or four percent of the population. That means the HUGE majority of the population does not hear from candidates at election time, and as we said above, it’s hard for people to trust elected officials they don’t know. Years ago, the general electorate – which votes on ballot questions and charter amendments – regularly voted down right-wing proposals like Ficker’s. Not anymore. On each of the last three occasions on which they were asked to settle a policy question, the voters opted for the less progressive option – approving Ficker’s property tax amendment in 2008, opposing the ambulance fee in 2010 and opposing some of the police union’s collective bargaining rights in 2012. Democrats account for roughly 60% of the county’s general election voters and not all of them are liberals. When it comes to general election voters deciding policy issues, all bets are off now. The last time Ficker tried to get term limits on the ballot was in 2010, when the county’s Board of Elections rejected his signatures. But the current board now has a Republican majority appointed by the Governor and was accused of “naked voter suppression” by the County Council during a recent dispute over early voting sites. Who among you believes that this new board will race to protect the council from term limits? When Ficker got term limits on the ballot in 2000, a large coalition of state legislators and business, labor and civic groups came together to oppose him. Two committees spent tens of thousands of dollars on mailings and campaigned vigorously to stop Ficker. The result was an 8-point loss for term limits. An anti-term limits lit piece from 2000. That is not happening now. Some participants in the 2000 coalition would actually be perfectly fine with term limits in 2016. The business community dislikes the tax hike and believes the county government does not do enough to compete with D.C., Virginia and the rest of Maryland. The public employee unions are upset about the council’s abrogating their collective bargaining agreements and one of the biggest unions may even SUPPORT term limits. And in a way, term limits may be in the strategic interest of these groups if they can get supportive candidates elected to the open seats. As for the state legislators, some may very well run for the open County Council seats in part because of council salaries, which are on track to be three times what Annapolis lawmakers receive. Robin Ficker may be the most unpopular political figure in the history of Montgomery County. Politicians and party activists have been laughing at him – and not in a good way! – for decades. But even the most clownish hecklers understand the old truism: he who laughs last laughs best. Montgomery County’s giant tax hike will have consequences. Here are a few of them. 1. Term limits are more likely to pass. There are several reasons why Robin Ficker’s newest term limits amendment will probably pass if he gathers enough signatures to place it on the ballot, but the tax hike is one of the biggest. The last time the council broke the charter limit in 2008, voters responded by passing Ficker’s charter amendment to make tax hikes harder. With a new tax hike in place, voters may be tempted to respond with term limits. Ficker has taken notice. 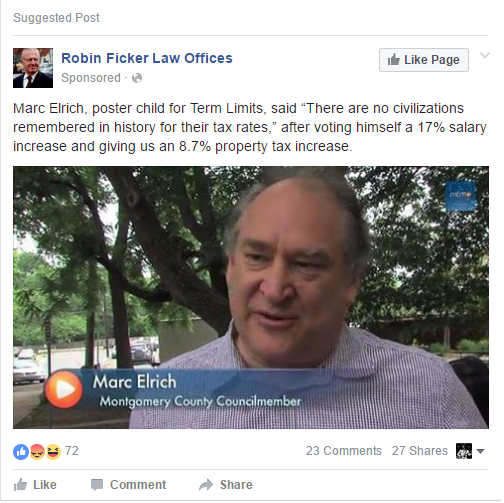 He regularly runs Facebook ads linking term limits, the tax hike and the council’s 2013 salary increase like the one below. Commenters respond predictably. Ficker may have a new ally in his quest to evict the council: MCGEO President Gino Renne. After the council voted to abrogate his union’s collective bargaining agreement, Renne told the Post, “I’m tired of these clowns,” and said his union might support term limits. An alliance between Gino Renne and Robin Ficker would be one of the strangest events in the history of MoCo politics. Whoever can produce a picture of these two smiling and shaking hands will be awarded a gift certificate from Gino’s beloved Department of Liquor Control. 2. Outsider candidates could be encouraged to run for county office. If term limits pass, two things will happen. First, the County Executive’s seat and five seats on the County Council will be open in 2018. Second, the tax increase will be blamed for the success of term limits. Both factors could lead to the entry of outsider candidates with a message like this: “We need new leadership. We need to do things differently.” Translation: we need to run the government without giant tax hikes. Some of these outsiders may use the county’s new public financing system to run. But the strong performance of David Trone, who started with zero name recognition and won many parts of CD8, will encourage self-funders. This being Montgomery County, there are a LOT of potential self-funders, including those who have previously run for office. Candidates in public financing can raise as many individual contributions of up to $150 each as they are able to collect, but the system caps public match amounts at $750,000 for Executive candidates, $250,000 for at-large council candidates and $125,000 for district council candidates. A wealthy self-funder could easily overwhelm candidates who are subject to these caps and make a mockery of public financing. 3. More charter amendments on taxes are possible. Ficker’s 2008 property tax charter amendment, which instituted the requirement that all nine Council Members must vote to override the charter limit on property taxes, was a mild version of his previous ballot questions on the subject. His 2004 Question A, which would have abolished the override provision entirely, failed by a 59-41 percent margin. Now that the 2008 amendment has been proven ineffective, Ficker could be encouraged to bring back his more draconian version soon. In the wake of this new tax hike, would voters support it? Passage of a hard tax cap would have very grave consequences for the ability of county government to deal with downturns. In 2010, the County Council responded to the Great Recession by passing a tough budget combining cuts, furloughs, an energy tax increase and layoffs of 90 employees. When the next recession comes, if the county has no taxation flexibility, it might have to pass a budget laying off hundreds of people and gutting entire departments. If the levying of giant tax hikes in non-emergencies causes the voters to abolish the possibility of levying them in true emergencies in the future, it would be a serious calamity. 4. Governor Larry Hogan is a big winner. One of Governor Hogan’s favorite political tactics is to play the Big Three Democratic jurisdictions against the rest of the state, with the City of Baltimore being his prime target. But he can also point to Prince George’s County, where the County Executive (and a potential election opponent) proposed a 15% property tax hike, and also to Montgomery County, where the council passed a 9% increase. His message to the voters will be a simple one. How many MoCo Democrats will ask themselves this question: “What is easier for me to live with? 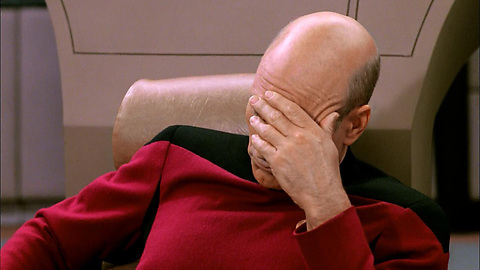 Larry Hogan or nine percent tax hikes?” What do you think their answer will be? Hogan received 37% of the vote in Montgomery County in 2014. He had a 55% approval rating in MoCo according to a Washington Post poll last October. A Gonzales poll taken in March found that registered voters in the Washington suburbs (defined as MoCo, Prince George’s and Charles) gave Hogan a 62.6% job approval rating, with 35% strongly approving. If Hogan can use the tax issue to run in the low 40s, or even as high as 45% in MoCo, he will be very difficult to beat for reelection. Reelecting himself is not Hogan’s only priority. He would also like to elect enough Republicans to the General Assembly to uphold his vetoes. That task is easier in the House of Delegates, where Democrats hold 91 seats, six more than the 85 votes required to override vetoes. If the GOP can pick up seven seats, as they did in 2014, they can uphold the Governor’s vetoes on party line votes. That would cause serious change in how Annapolis operates. Could big tax hikes in Democratic jurisdictions like Montgomery help the GOP get there? 5. It will be harder to get more aid from Annapolis. 6. A major argument in favor of the liquor monopoly has been proven hollow. County officials predicted that if the liquor monopoly was lost, annual property taxes would have to rise by an average $100 per household. Instead, the monopoly was preserved and the council passed a property tax hike that will cost an average $326 per household. The tax hike was in the works since at least January 2015, long before small businesses and consumers launched their campaign to End the Monopoly. And the $25 million in new spending added by the council to this year’s budget actually exceeds the $20.7 million that the liquor monopoly is projected to return to the general fund. This proves once and for all that liquor monopoly revenues do not prevent tax hikes! 7. There will be pressure in the future for another tax hike. As we discussed in Part Three of this series, the U.S. Supreme Court’s Wynne decision, which requires counties to refund taxes paid on out-of-state income, was one reason for the current property tax hike. Senator Rich Madaleno’s state legislation extended the time that counties had to pay for refunds from Fiscal Year 2019 to 2024. Below is a table showing the fiscal impact on all Maryland counties combined, of which Montgomery accounts for roughly half. While the legislation enables counties to spend less in FY 2017-2018, it requires them to spend more in FY 2020-2024. MoCo will have to spend around $20 million a year in most of the out years. Given its $5 billion-plus annual budget, Montgomery could easily afford the out-year payments by slightly slowing the growth rate in its annual spending. But instead, the council added $25 million in new spending on top of the Executive’s FY 2017 budget, and unless it is cut, that spending will continue in future budgets. The cumulative impact of that new spending plus future Wynne refund payments will start to be felt in three years. At that point, the council could very well face a choice between trimming back their added spending or raising taxes. What do you think they will do? 8. Economic development will now be harder. Despite the wealth in some of its communities, Montgomery County struggles with the perception that it is not business-friendly. While its unemployment rate is low by national standards, its real per capita income fell steeply during the recession, much of its office space is obsolete and it lacks Northern Virginia’s two major airports and its new Metro line. The chart below shows the county’s private sector employment from 2001 through 2014. Despite recent sluggish growth, the county had fewer private sector jobs in 2014 than it did in 2001. 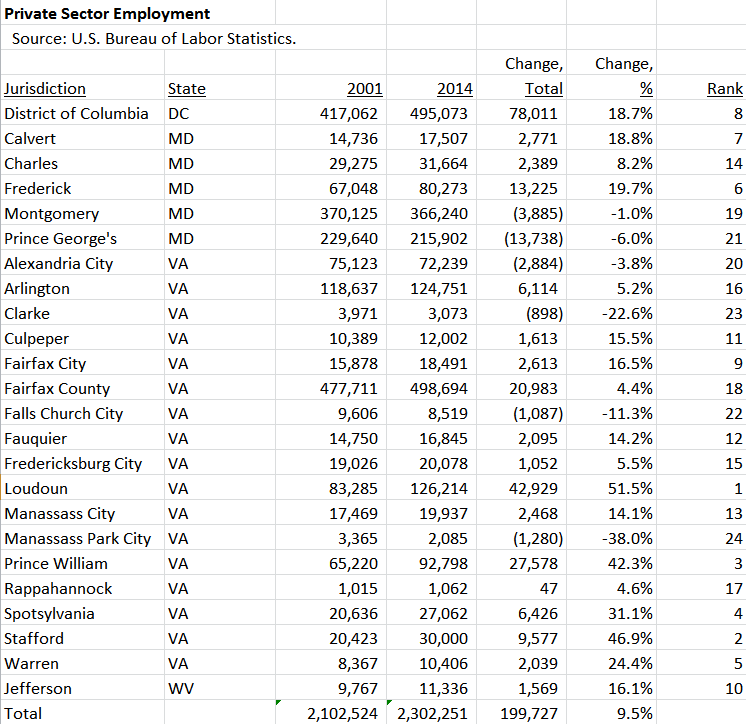 And while the county lost private sector jobs, the Washington region as a whole grew by 9.5% over this period. Good government is an exercise in balancing needs. Education, transportation, public safety and public services are valuable and require resources, at times necessitating tax increases. But all of that is impossible without a vigorous private sector that creates jobs and incomes and pays the government’s bills. Those priorities must be balanced, and when they are, progressive policies can be afforded. But if they are not, economic growth will fail, government services will be harder to sustain, taxes will fall increasingly on a shrinking base and a downward spiral could begin. In the wake of its long-term stagnant economy and its Giant Tax Hike, how close is Montgomery County to that tipping point?